Toronto hadn’t swept a California road trip 3-0 since December 1995, and hadn’t even been in a position to do so since then, until they won the first two outings on this trip in Los Angeles and then San Jose before arriving in Anaheim on Friday. 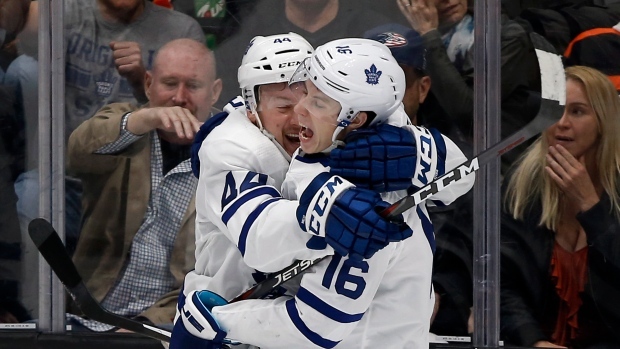 The game was tied 1-1 after sixty minutes, following goals by Patrick Marleau in the first period and Pontus Aberg in the second, and Toronto advanced to overtime for the third time this season where Morgan Rielly buried his ninth goal of the season off a two-on-one feed from Mitch Marner to seal Toronto’s third straight win. They are also 3-0 this season in overtime. With the marker, Rielly extended his point streak to five games (three goals, four assists) and leads all NHL defencemen in points (25) and goals (9). Rielly finished his night with four shots on goal, in a team-leading 23:16 time on ice. Friday’s victory also put Toronto at the top of NHL standings after 20 games, one point ahead of Tampa Bay and Nashville (who have each played 19 games). Coming off a lacklustre start for the Leafs in their 5-1 loss to the Boston Bruins last Saturday, backup goaltender Garret Sparks was aiming to think a little less, and trust his instincts a little more, in his next outing. That came in Anaheim on the second night of Toronto’s third back-to-back this season, a game Mike Babcock always designates for his second netminder. Sparks ultimately accomplished his goal (with a little help from his teammates) to notch the third win of his season in a career-high 38-save performance, with .974 save percentage. Sparks didn’t face as many high-quality scoring chances in the first period that Ducks’ goalie John Gibson did, not with Toronto controlling play early in the frame and jumping out to a 1-0 lead off Marleau’s goal. But when Anaheim found their legs, Sparks had to make some tough saves, including from point blank range on Marcus Pettersson late in the first period when the Ducks managed some sustained pressure in the Leafs’ end. The Ducks’ line of Ryan Getzlaf, Rickard Rakell and Pontus Aberg were the only consistently dangerous unit Anaheim had offensively for most of the night, and they eventually broke through when Aberg put a shot right under Sparks’ blocker to tie the game late in the second period, 1-1. In the third period, Sparks was under siege for the second half of the frame and needed help from his defencemen to control the chaos. He was down and out on two occasions where Ondrej Kase and Rakell had open nets to score on, and it was Jake Gardiner and Nikita Zaitsev who stepped in to block the shot and keep the Leafs’ tied. Babcock said after the game he thought Friday was Gardiner's best game of the season, which he finished at 57 per cent possession, with three blocked shots, three shots on goal and a plus-one rating in 23:00 tie on ice. In the end, Sparks prevailed by playing more simply, but also by showing more confidence to attack to the puck than he had in Boston. Only five games shy now of the 1,600th of his career, Patrick Marleau has hit innumerable milestones to date, including another small one in Friday’s contest. Early in the first period, Marleau was in the right place at the right time to get credit for a deflection goal in front of John Gibson, and put the Leafs ahead 1-0. It was the 539th goal of Marleau’s 21-season NHL career, putting him past Keith Tkachuk on the league’s all-time goals scoring list for sole possession of 32nd place. His goal in Anaheim wasn’t the only contribution Marleau has made lately on the scoresheet. He quietly produced six points (two goals, four assists) in the seven contests leading into Friday’s game, and has been showing a burgeoning chemistry with linemate Kasperi Kapanen, who he set up for a goal in Thursday’s 5-3 win over San Jose and who he connected with again on a few chances in Anaheim. Marleau may be the eldest member of the Leafs at 39-years-old, but with his speed he can still give an opponent fits and keep up with Toronto’s young core while being effective at both ends of the ice. He finished Friday’s game with two shots in 17:51 time on ice. Continuing with a season-long trend of going swiftly from hot to cold on the power play, the Leafs were decided cool with the extra man in Anaheim. The Leafs’ second unit of Tyler Ennis, Josh Leivo, Kasperi Kapanen, Andreas Johnsson and Jake Gardiner used their time to generate some solid chances, mainly from Ennis who tried backdoor and from the hashmarks to get past Gibson, to no avail, on Toronto’s first power play. But the Leafs’ second man advantage chance was completely anemic, with Anaheim controlling the puck for nearly the entire two minute power play and advancing into the Leafs’ end multiple times. Toronto finished the game 0-for-2 with the extra attacker. It was just two games ago, against the L.A. Kings, that the Leafs’ power play looked more potent than ever, going 3-for-6. That, after a stretch where Toronto was 3-for-28, and since they’re now 0-for-5. Operating as the least penalized team in the NHL, the Leafs’ penalty kill doesn’t see a ton of action, but they went to work once against the Ducks in the third, and held a strong power play bid from Anaheim at bay to finish 1-for-1. For the first few weeks of the season, scoring first in a game was far from Toronto’s strong suit. They only accomplished it three times in their first 10 outings, but won each time they did. Since late October, the Leafs have done a better job in the opening period, and heading into Friday’s game had gotten on the board first in their last two games and were 8-0 on the season when tallying the first marker. That streak continued with Marleau’s goal against the Ducks, and represented how the Leafs have focused on using their speed early against opponents and been more aggressive putting pucks on net. The Leafs are now 8-0-0 this season when leading after 20 minutes. Toronto comes home to face the Columbus Blue Jackets on Monday.